You know how the English-Canadian media is always lecturing the Québécois on how their language issues are distracting them from the real important stuff, like economic developement and roads? And how the separatist obsession with language is killing Montreal and has been causing it’s decline? Two stories broke in the news yesterday. One involved language, the other one about… hum… just something about the Mafia running the City of Montreal. 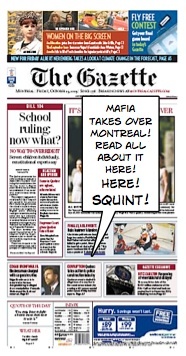 The three French-language dailies in Montreal headlined with the Mafia story. 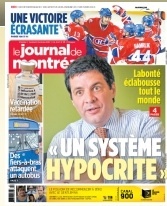 Only le Devoir even mentioned the Supreme Court ruling on bill 104 on the first page. 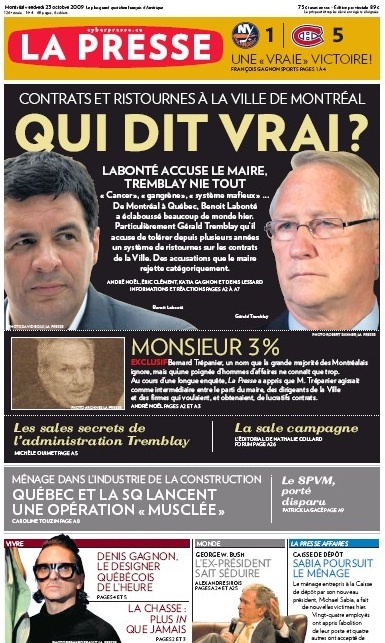 The Montreal Gazette went for the language headline and gave the story about the former of leader of the opposition and former executive council member Benoit Labonté’s allegations that the City of Montreal’s administration is hostage to organised crime a whopping 1/40th of the front page. Inside, the Gazette gave the language story more that 4000 word, including the main editorial. The City Hall scandal? 332. Eighteen less words that this post. The National Post also headlined with language. No national daily in Canada mentions the fact that Canada’s second major city is in the midst of a major corruption scandal one week from a general election. A Google.ca news search for bill 104 on the 22nd and 23rd of october returned 167 stories in English. A search for Labonte returned ony 21 articles. A search in French netted 84 stories for Labonte as opposed to only 47 about Loi 104. Vigile.net, the ultra-nationalist clearinghouse for all things language and separatism-related in the Québec media lists 50 stories on Bill 104 and 90, almost twice as many, on the City Hall scandals. Even those language-obsessed separatists of the Parti Québécois are reported by Radio-Canada not to have mentioned language, the Supreme Court or Bill 104 for the first 20 minutes of question period! Meanwhile, the “Top court strikes down Quebec English school law” is the most active story of the day on CBC.ca with 1170 comments and growing. The four stories on the Montreal situation, stories that just might be the answer to the eternal question as to why Montreal has so many potholes, have a total of 94 comments. 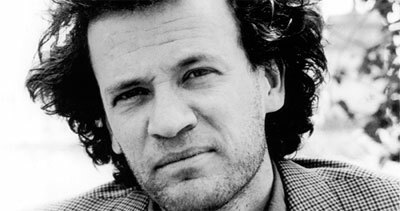 I was watching you on Radio-Canada’s Tout le Monde en Parle last Sunday and I heard you say something so grotesque, so stupid and so ignorant that I felt I had to respond. So I’m going to do exactly what you are doing to Stephen Harper and send you a couple of books to set you straight. Feel free to pass them along to Steve when you’re done. Don’t get me wrong, I’m an anglophile. I read and write in English all the time. I read Life of Pi in English. My Dad was raised much like you, speaking French at home but going to English schools. My grand-father was the son of a protestant preacher’s daughter who went to Catholic school with Félix Leclerc. English is a fine language, Yann, but the one thing it isn’t is a language just like any other. When I went to China a couple of years ago, young students would stop me on the street and beg me to – please, please mister! -speak English with them for ten minutes. Do you think they behaved like that because they just happened to prefer your books to those of Michel Houellebecq or Lao-Tzu? Of course not. These students wanted – needed – to master English because it was their only way into the best universities, free economic zones and a decent life. English was the difference between a meaningful career and a lifetime of stamping documents at the Sechuan Ministry of Public Works. That’s what English is today. It’s the great gatekeeper. Ninety percent of Korean workers have to take English tests all through their careers just to keep their jobs. Do you really thing that English is just another language to them? Do think that the parents of the 30 000 Korean elementary school students that are sent to study in English-speaking countries every year in this world that confuses English with intelligence feel that it is a language like any other? Elementary school kids, Yann. They’re not even ten years old yet! Unlike you and me, Yann, most people in the world didn’t have the privilege of learing educated standard English effortlessly while they were young. Cultivating the illusion that one chooses a language in which to persue a career and bogus theories about the equivalency of cultures and the benign nature of the worldwide spread of English is a luxury most of the world doesn’t have. It might help you to rationalise the fact that the ability to write in the language of your ancestors has been educated out of you, but you are only kidding yourself. So here’s a couple of books I think you should read. If you are in a scholarly mood, I suggest Linguistic Imperialism by Robert Phillipson or anything you can pick up by Alastair Pennycook. You might also want to check out Buying Into English, the very interesting book by Catherine Prendergast, an American teacher who witnessed first hand how English transformed from a tool of freedom to a crash course in capitalism in Slovakia. But the book I’m sending you is Decolonizing the Mind by Ngugi Wa Thiong’o, about his rise to international fame in English and his realization the language had only really put him to the service of the English-speaking elite of Europe and America and completely isolated him from Kenya and Africans. It’s the last book in English he ever wrote. I’ve alway though the story of Bruny Surin and Donovan Bailey were the perfect metaphor to explain Québec identity to those who couldn’t understand it in other terms than ethnicity and race. On the 27th of september 1996 at the Summer Olympic Games in Atlanta, Donovan Bailey ran the 100m dash in 9.84 seconds, broke the world record, clinched the title of fastest man in the world and vindicated Canada’s honour after the humiliation of the whole Ben Johnson episode. A Canadian hero had arrived. Well… except in Québec. People in Québec appreciated what Bailey had done, but they didn’t quite identify with the Jamaica-born athlete in the same way other Canadians did. In 1996 another runner who hadn’t even qualified for the final became Québec’s hero. Bruny Surin. 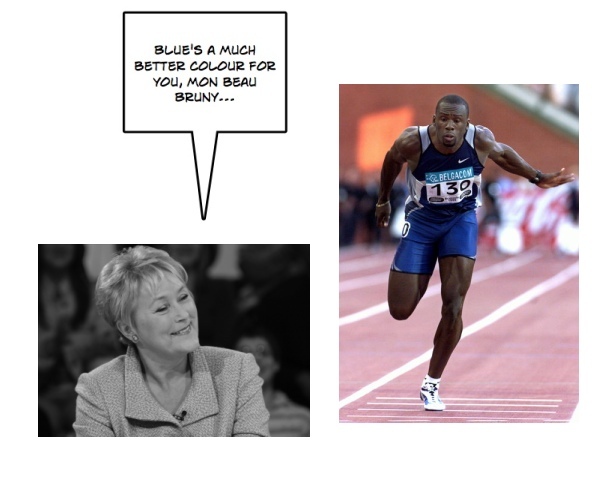 Why did people in Québec identify with Bruny Surin and not with Donovan Bailey? Bailey and Surin are both black. They were both born in the Caribbean in 1967 and emigrated to Canada in their teens. Bailey and Surin both loved playing basketball and it is while they were dribbling and shooting hoops that some Phys. ed. teacher noticed their potential and encouraged each of them to persue athleticism and running. Both Surin and Bailey quickly achieved international success. They worked with the best european coaches and trained year round on the sunny campuses of american universities. They both became key members and medal hopefuls of Canada’s Olympic team in 1996 and it is wearing the same red and white maple-leafed uniform that they won the gold medal of the 4X100m relay. Today they share the Canadian record for the 100m sprint: 9.84 seconds. Objectively, Bailey, not Surin, is the great Canadian hero. Bailey set the Canadian (and then world) 100 meter dash record while winning a gold medal in Atlanta. Surin failed to make the final as a solo runner in 1996 and only equaled Bailey’s performance years later in Seville when he finished second at the 1999 World Championships. Yet, in 2009, Bruny Surin is still a star in Québec. He’s a successful businessman, big corporations pay him thousands of dollars to give pep talks to their employees and he is still a regular on the television and media circuit. Meanwhile, if it wasn’t for racial profiling, thirteen years after his triumph in Atlanta, Donovan Bailey could probably cross the entire city of Laval could without a single person stopping him on the way. The reason people identify with Surin and forgot Bailey has nothing to do with race, ethnicity or immigration. It’s very simple actually. Bruny Surin and his family live in Québec and speak French with an (haitian-flavoured) Québec accent. Bruny Surin lives in their world and Donovan Bailey, no matter how many maple leafs are on his jacket, does not. That’s it. It’s not anymore complicated than that. There is no great anti-Québec conspiracy theory here. Donovan Bailey won fair and square. Bruny Surin succeeded at all he did, yet always seemed to carry the stigma of the one who chokes at great historical junctures. Hey, maybe that’s what the Québécois identify with. This doesn’t mean there is no racism in Québec, or that young Haitians in Montreal do not face discrimination. But this is not different than the discrimination black and Jamaican kids face in Toronto, despite Donovan Bailey’s success. Bruny Surin’s biography just came out (haven’t read it) and he is said to be shopping for a political party to persue a political career. Surin isn’t associated with any political team yet, but he has publicly supported the Parti Québécois‘ Richard Legendre in the past. Should that ever happen, I can’t wait to see Canada’s reaction when an Olympic medalist who carried the Maple Leaf flag up high countless times joins the Parti Québécois. I know, I know, you won’t hate him because he’s an ungratful immigrant. Just because he’s a separatist.